This article won first prize in the recent British Junior Cardiologists’ Association (BJCA) essay competition. Coronary angiography stubbornly bucks the hospital-wide trend to non-invasive diagnostic tests. New imaging technologies offer paths to better ways to investigate and manage ischaemic heart disease. Diagnostic coronary angiography died some time ago, so why has it still not yet been buried alongside the exploratory laparotomy? The problem is clear: despite over half a century of experience, almost two-thirds of those undergoing elective diagnostic angiograms do not have obstructive coronary artery disease.1 Even in contemporary National Health Service (NHS) cardiac catheter laboratories, non-flow limiting coronary disease or angiographically normal coronary arteries remain common findings. Coronary angiography is now, arguably, the last invasive procedure to be performed with primarily diagnostic intent on this scale. How do we move to a situation in which invasive angiography is instead performed primarily to deliver therapeutic intervention, while identifying patients suitable for reassurance, medical therapy or surgery long before they reach the cath lab? In 2017, computed tomography (CT) straightforwardly offers the best alternative to invasive angiography for the anatomical assessment of epicardial coronary disease. Rapid advances in row detector width, the introduction of dual sources, and new image reconstruction protocols now enable high-resolution, single-heartbeat coronary imaging with sub-millisievert doses, though clinical uptake in the UK is inconsistent and lags behind European, Asian and North American centres. One reason for this is the perception that standard CT angiography shares the same inherent limitation as standard invasive angiography: the inability to confidently determine which epicardial coronary stenoses of intermediate severity will benefit from intervention. A lesion of intermediate severity on CT, therefore, frequently results either in an invasive angiogram (with or without fractional flow reserve [FFR] assessment) or a further non-invasive test; CT computational estimates of FFR2 and perfusion imaging3 are not yet widely available or accepted by referring clinicians. 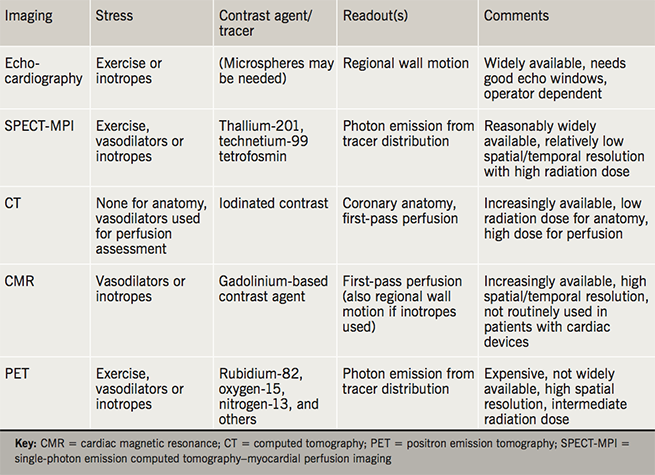 As a result, the use of functional imaging tests, which indirectly assess myocardial ischaemia by measuring surrogate markers, such as perfusion or regional wall motion during vasodilator, inotropic, or exercise stress (table 1), remains high. The drive for better non-invasive ischaemia tests to replace diagnostic angiography is a significant technical challenge, which stems from the paradigm that it is the response of myocardium to ischaemia, rather than plaque appearances, which primarily determines the clinical response to intervention.4,5 It follows that the ideal non-invasive test would combine coronary anatomy with a reliable assessment of inducible myocardial ischaemia. Important limitations of the routinely available functional tests within the cardiologist’s armamentarium (stress echocardiography, perfusion cardiovascular magnetic resonance imaging [MRI], single-photon emission computed tomography–myocardial perfusion imaging [SPECT-MPI]) include largely qualitative readouts, subjective interpretation, and technical difficulties in key patient groups (e.g. obesity). The possibility of missing balanced ischaemia remains a concern to clinicians referring patients for some of these tests. Arguably, no functional ischaemia test commands the confidence of cardiologists to the same degree as does the coronary angiogram, but can even invasive angiography with FFR assessment truly be considered a ‘gold-standard’ test for myocardial ischaemia? Although routinely validated against one another,6 angiography, perfusion and wall-motion assessments all measure different physiological parameters as surrogate markers of myocardial ischaemia. It is, therefore, not surprising that discrepancies between the findings of these tests exist; an inducible perfusion defect due to microvascular rather than epicardial coronary disease will be classified as a ‘false-positive’ if angiography with FFR is the reference standard and vice versa. If myocardial ischaemia truly underlies clinical response to treatment, the ideal non-invasive test should provide a quantitative measure of earlier and more fundamental measures of ischaemia than late downstream consequences, such as hypokinesia or electrocardiographic abnormalities. Although still technically a measure of perfusion rather than ischaemia, cardiac positron emission tomography (PET) using tracers, such as rubidium-82, offers advantages over commonly available functional tests, including quantitation of myocardial blood flow, rapid acquisition times, and the opportunity to assess coronary calcium during the low-dose attenuation correction CT.7 However, the interplay between the degree of inducible hypoperfusion and true myocardial ischaemia may vary between patients, and a novel MRI technology may offer benefits beyond even PET for assessing the earliest molecular responses of the myocardium to ischaemia. The heart, a transducer of chemical to mechanical energy, requires a continuous and matched supply of metabolic fuels (such as fat and glucose) and oxygen to sustain the rapid cellular energy cycling processes that sustain pump function.8 Within seconds of the interruption of the fine balance between cardiac work and oxygen delivery, a comprehensive shift in the myocardial metabolic programme occurs. Along with other signals, the reduced forms of cofactors, including nicotinamide adenine dinucleotide (NADH), accumulate in mitochondrial and then cytosolic spaces, shifting cardiac energy metabolism away from oxidative metabolism and towards oxygen-sparing anaerobic glycolysis. These ancient and highly conserved reactions drive the conversion of cytosolic pyruvate to lactate to preserve cardiac energetics and maintain pump function. Hyperpolarised carbon-13 MRI is an emerging technology in which the magnetic properties of externally prepared substrates are dramatically enhanced to create tracers with huge, though short-lived, increases in MRI signal.9 By administering hyperpolarised pyruvate to humans, it is now possible to measure the regional interconversion of myocardial pyruvate, bicarbonate and lactate at high resolution, using an essentially standard MRI scanner (figure 1).10 In addition to mapping regional ischaemia-induced lactate production, hyperpolarised pyruvate also offers mapping of myocardial ischaemic pH shifts by assessing the carbonic anhydrase dependent interconversion of hyperpolarised bicarbonate and carbon dioxide (figure 1, panel c).11 This technology, therefore, paves the way to an earlier and more fundamental assessment of cardiac ischaemia than has previously been possible with any other technique.12 Parallel advances in cardiac MRI offer ever-improving images of the proximal coronary arteries, alongside the routinely available high-quality assessments of wall motion, first-pass perfusion,13 and viability to complement hyperpolarised metabolite imaging, which could add just 5–10 minutes to the standard imaging protocol. Is the age of elective diagnostic coronary angiography truly over? No, and this is because no widely available non-invasive imaging test offers a truly compelling ‘one-stop-shop’ for coronary anatomy and myocardial ischaemia. New hybrid imaging tests, such as coronary CT with rubidium-82 PET or coronary MRI angiography with hyperpolarised lactate mapping, however, offer a vision of a future in which the diagnostic performance of the invasive coronary angiogram for true ischaemia is not simply approached, but may be exceeded. A more focused programme of targeted intervention restricted to defined target plaques proven to be causing downstream ischaemia would be expected to lead to better clinical outcomes from these procedures, as well as removing the low-but-not-zero risks of invasive angiography from those without true ischaemia. In developing these non-invasive techniques in an arterial system as small, mobile, and technically challenging as the coronary tree, there exists the opportunity for cardiologists not merely to catch up with the road-mapped procedures of neurological and vascular interventionists. Rather, cardiologists should develop these, and other advances, to lead the definition of new diagnostic and therapeutic paradigms for diseases resulting from the acute and long-term consequences of ischaemia. Can marriage mend a broken heart (and save the National Health Service)?